Rising debt vulnerability in low-income countries (LICs) is emerging as a front-burner issue. Analysts at the IMF and elsewhere are tracking increases in public debt ratios that had fallen after the Heavily Indebted Poor Countries Initiative and the Multilateral Debt Relief Initiative. Forty percent of LICs are either in, or at high risk of, debt distress. Many factors have contributed to rising debt-to-GDP ratios: falling commodity prices, deteriorating fiscal balances, conflict, and corruption, among others. The larger fiscal deficits are fully or partially accounted for by increased public investment in about half of LICs. Which brings us to the challenge of financing the SDGs. As my colleague Mark Plant points out, under a conservative set of projections about various sources of finance, achieving the SDGs will require piling a lot more public debt on top of what has already been borrowed by LICs. The only alternatives to this unsustainable scenario are (1) more domestic resource mobilization (DRM), (2) more mobilization of fully private infrastructure and other SDG-related investment, (3) more ODA grants, or (4) more concessional lending by multilateral development banks and development finance institutions that LICs can better sustain. All of the above will likely be necessary, and we at CGD have written separately on options 2 and 4. Here, under option 1, I want to propose a surge in support for LIC DRM. Tax revenues as a share of GDP in LICs are trending upwards, though from a low base. Median central government tax revenues as a share of GDP in LICs have risen from 13.6 percent in 2012 to 15.3 percent in 2017 (Figure 1). Note: Data missing for numerous LICs—at least 10 in any given year. But there is wide variation across countries. IMF researchers reckon that growth in GDP/capita picks up significantly once tax ratios reach about 13 percent. If this is the floor, the frequency distribution below (Figure 2) shows that many LICs have a long way to go. Source: IMF World Revenue Longitudinal Dataset. Taken from “Enhancing the Effectiveness of External Support in Building Tax Capacity in Developing Countries. Prepared for Submission to G20 Finance Ministers,” IMF, OECD, UN and WBG, July 2016, www.oecd.org/ctp/enhancing-the-effectiveness-of-external-support-in-building-tax-capacity-in-developing-countries.pdf. How is the development community responding? 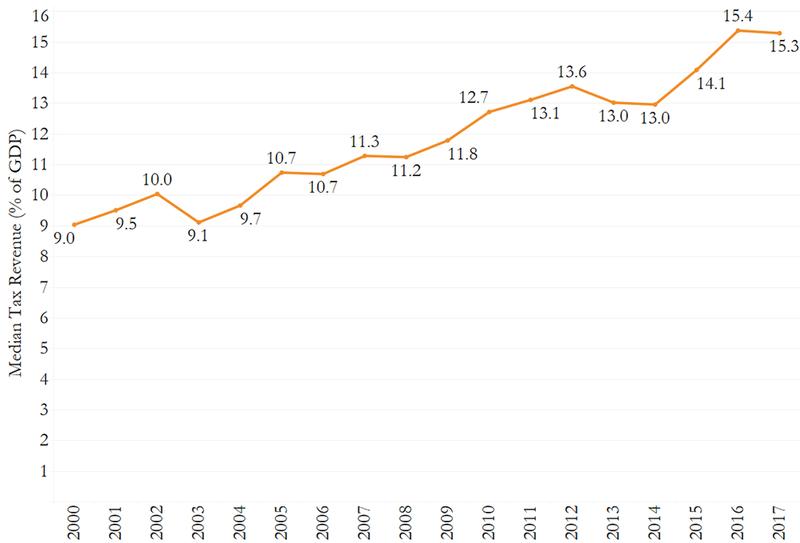 Increasing technical assistance for tax policy and administration has been a focus since the 2015 Addis Tax Initiative, but the volume of this kind of ODA does not suggest that it alone will generate sufficient progress. In 2014, commitments for tax capacity building accounted for 0.10 percent of ODA. A recent Oxfam report concludes that donors “are not on track to meet their commitment to double support for DRM.” The increase in funding in 2016 was only 5 percent, and, while the number of DRM projects is rising, the average project size is only $332,000. For 96 out of 106 countries with DRM projects, the average project size is $170,000. Direct evidence of the impact of technical assistance on tax revenues is mixed. The World Bank Independent Evaluation Group found in 2017 that policy loans “focused on raising tax revenue through tax administration measures were mostly successful at national and subnational levels; those that supported tax policy to raise tax collection or improve tax efficiency or equity were less successful.” There are no recent independent evaluations specifically of the IMF’s tax technical assistance, though the IMF is in the process of upgrading its evaluation of technical assistance and capacity-building activities. A Platform for Collaboration on Tax launched in 2016 by the IMF, the OECD, the UN, and the World Bank has recommended improvements in support for tax capacity, including better coordination among assistance providers, a manual for good practices, and the establishment of sound-practice results indicators. Meanwhile, the clock for achieving the SDGs by 2030 is ticking. Waiting and hoping for progress on DRM while LIC public debt levels rise seems a risky strategy. Can multilateral development banks do more? The multilateral development banks (MDBs) have the ability to offer strong incentives for LICs committed to DRM, and to help build the political will to make it possible. This is an area where paying for outcomes makes a lot of sense. MDBs could, for example, use concessional lending to match half of a 1 percentage point increase in the tax revenue-to-GDP ratio—especially in countries that fall below the estimated tipping point of 13 percent. By incentivizing revenue increases and making more room for growth-promoting public investment, the additional concessional borrowing would strengthen, not weaken, long-term debt sustainability. MDBs already have tools to execute such a match. The World Bank’s Program-for-Results (PforR), for example, could be used for this purpose. The indicators used to trigger disbursements could be defined in terms of tax revenue-to-GDP ratios. From 2005–2015, only two PforR programs focused specifically on tax reform, but there does not appear to be any inherent problem with using PforRs in this way. In addition, about 20 percent of the World Bank’s Development Policy Loan (DPL) commitments from 2005–2015 have been directed toward tax policy and administration reforms, but mostly in middle income countries (MICs) and mostly as a small component of the overall DPL. LICs received 24 percent of tax projects, but only 5 percent of commitments. The structure of the proposed loans would be consistent with the original concept of Cash on Delivery. Disbursement would be tied to outcomes, not inputs. Prior actions would be defined simply as tax-to-GDP ratios, rather than a complicated series of intermediate indicators. Especially in an area as politically fraught as tax reform, countries need to be given great flexibility to determine the policies and administrative path to greater revenues. An argument can be made, however, for an exception to a pure outcomes-based approach around equity and poverty considerations. Given countries’ tendency to rely increasingly for additional revenue on indirect taxes that are easier to administer, there is a risk that the poor could become net payers if redistributional tax and spending policies are not in place. In fact, the Oxfam report notes that only 2.8 percent of DRM technical assistance projects include “clear goals on equity or fairness.” It would be reasonable to make eligibility for the outcomes-based loans depend on the development of a larger fiscal framework that meets equity and poverty-reduction criteria—at the very least barring approaches that worsen poverty after taxes and social transfers. Another compelling feature of outcome-based operations is that they could be used to contribute to accountability and transparency. Verification that revenue targets have been met could be designed to require that revenues go into a central treasury account used to fund expenditures in accordance with the country’s approved budget, rather than disbursed into numerous ministry accounts, weakening control and the ability of the finance ministry to track their use. A rigorous evaluation of whether tax revenue outcomes are achieved—perhaps by independent private auditors funded by the MDB—would be essential. And technical assistance would still be available to help governments build tax systems that are effective, equitable, and efficient, within country-owned policy parameters. The size of the concessional loans could be tailored to the country and need not be overly large. For 21 out of 31 LICs, 0.5 percent of GDP amounts to less than $75 million. This approach should be a win-win for donors and recipient LICs. The loans should be attractive to reformers in LIC governments who would see greater gains from their revenue-raising efforts. And they should be attractive to donors and MDB shareholders, who are generally more inclined to help countries that are helping themselves. To be clear, some donors would need to change their mindsets. This approach would be a shift from MDB support for specified expenditures to MDB support for the mobilization of resources to be spent according to the budget priorities identified by the recipient country. In some LICs, that might not be sensible, but the MDBs are well placed to identify those LICs that are serious both about mobilizing revenue and spending it well. Thirty-one LICs as defined by the World Bank: Afghanistan, Benin, Burkina Faso, Burundi, Central African Republic, Chad, Comoros, Dem. Rep. of Congo, Eritrea, Ethiopia, Gambia, Guinea, Guinea-Bissau, Haiti, Dem. People’s Rep. of Korea, Liberia, Madagascar, Malawi, Mali, Mozambique, Nepal, Niger, Rwanda, Senegal, Sierra Leone, Somalia, South Sudan, Tanzania, Togo, Uganda, and Zimbabwe. Available at https://datahelpdesk.worldbank.org/knowledgebase/articles/906519-world-bank-country-and-lending-groups. Masood Ahmed, “Another Debt Crisis for Poor Countries?” Center for Global Development, Blog, April 2018, www.cgdev.org/blog/another-debt-crisis-poor-countries. “Macroeconomic Developments and Prospects in Low-Income Developing Countries,” IMF, March 2018, www.imf.org/en/Publications/Policy-Papers/Issues/2018/03/22/pp021518macroeconomic-developments-and-prospects-in-lidcs. Nancy Lee, “More Mobilizing, Less Lending: A Pragmatic Proposal for MDBs,” Center for Global Development, April 2018, www.cgdev.org/publication/more-mobilizing-less-lending-pragmatic-proposal-mdbs; Nancy Lee, “Billions to Trillions? Issues on the Role of Development Banks in Mobilizing Private Finance,” Center for Global Development, November 2017, www.cgdev.org/publication/billions-trillions-issues-role-development-banks-mobilizing-private-finance. High Level Panel on the Future of Multilateral Development Banking, Nancy Birdsall and Scott Morris, “Multilateral Development Banking for this Century’s Development Challenges,” Center for Global Development, October 2016, www.cgdev.org/working-group/high-level-panel-future-multilateral-development-banking-exploring-new-policy-agenda; Mark Plant, “8 Ideas on Reforming the MDBs for the Eminent Persons Group,” Center for Global Development, Blog, April 2018, www.cgdev.org/blog/8-ideas-reforming-mdbs-eminent-persons-group. Vitor Gaspar, Laura Jaramillo and Philippe Wingender, “Tax Capacity and Growth: Is there a Tipping Point?” IMF, November 2016, www.imf.org/external/pubs/ft/wp/2016/wp16234.pdf. “Enhancing the Effectiveness of External Support in Building Tax Capacity in Developing Countries. Prepared for Submission to G20 Finance Ministers,” IMF, OECD, UN and WBG, July 2016, www.oecd.org/ctp/enhancing-the-effectiveness-of-external-support-in-building-tax-capacity-in-developing-countries.pdf. “Doubling Down on “DRM”: Are We Making the Right Bets?” Oxfam, May 2018, www.oxfamamerica.org/static/media/files/DOUBLING_DOWN_ON_DRM_-_2018_LVC7aXc.pdf. Independent Evaluation Group Learning Product, “Tax Revenue Mobilization,” World Bank, March 2017, http://ieg.worldbankgroup.org/sites/default/files/Data/Evaluation/files/lp-taxrevenue-03152017.pdf. Report of the Inter-Agency Task Force on Financing for Development, “Financing for Development: Progress and Prospects,’” UN, https://developmentfinance.un.org/sites/developmentfinance.un.org/files/Report_IATF_2018.pdf. Nancy Birdsall and William D. Savedoff, “Cash on Delivery: A New Approach to Foreign Aid,” Center for Global Development, 2011, www.cgdev.org/sites/default/files/1423949_file_CODAid_SECOND_web.pdf. Nora Lustig, “Fiscal Policy, Income Redistribution and Poverty Reduction in Low and Middle-Income Countries,” Center for Global Development, January 2017, www.cgdev.org/publication/fiscal-policy-income-redistribution-and-poverty-reduction-low-and-middle-income; Charles Kenny and Justin Sandefur, “Taxing the Poor to Give to the Bureaucrat,” Center for Global Development, Blog, May 2018, www.cgdev.org/blog/chart-week-taxing-poor-to-give-to-bureaucrat.